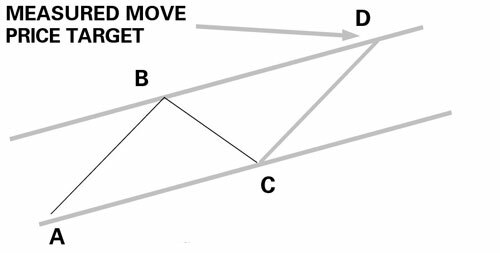 The term measured move is used in a number of contexts in technical analysis, so it can become confusing. In essence, a measured move is a forecast of the upcoming price move after a chart event, including completion of a pattern. Unfortunately, these forecasts are seldom correct, or rather, they vary by too much from actual outcomes to serve as reliable trading guides. One definition of measured move is the price change expected to result from a particular pattern. For example, in the ascending triangle in this figure, the gray lines denote the height of the pattern. Imagine that the distance between the high and low within the pattern is $5. After the price breaks out above the top of the triangle, you expect the subsequent rise to be the same amount, $5. One useful (if general) observation is that the size of a move after a pattern is proportional to the size of the pattern. When a pattern takes a long time to form (three months or more) and when it’s very deep (30 to 50 percent of the annual high-low range), the bigger the eventual reaction to the pattern. Another type of measured move is when a price repeats the extent of a first move after a retracement. The retracement takes back 30 percent of the gain from the low to the high, or some other percentage. The point is that after the retracement, you often see the price resume the trend at the same slope and to the same extent as in the first move. In this example, you see an already established channel consisting of support and resistance lines. The price is oscillating between the two channel lines. After you see the price stop at Price C, you simply copy and paste the A-to-B move to C to arrive at price target D.
A third type of measured move is when you have a gap. A gap is a price bar whose high or low is separated from the preceding bar by open space, meaning that no trades took place at those intervening prices. A gap is important because it shows, graphically, that something happened to alter perception of the security. In this figure, you measure the distance from the lowest low in the up move to the middle of the gap, and then project that height from the middle of the gap to the upside (in an uptrend). You do the opposite in a downtrend.